Blogging is just so easy for some people! For me, it's torture. Someone please tell me it will get easier! I have this idea to share information on my blog about food because my paintings are mostly of food. But, another drawback, I don't like to cook! Never have! Alas, my friend Cathy Hill has unwittingly come to my rescue. Her art is cooking, gourmet cooking no less. She has just started a blog called www.semiblonde.com. I know that title has nothing to do with food, but I suppose she thought it was fitting since she is 'semi-blonde'. 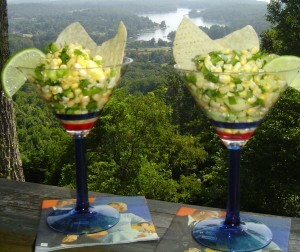 Her July 4 post included the recipe for Spicy Sweet Corn Relish. (I know this doesn't relate to any of my paintings but I'm desperate!) She even got a little artsy in her serving choice! Check it out! 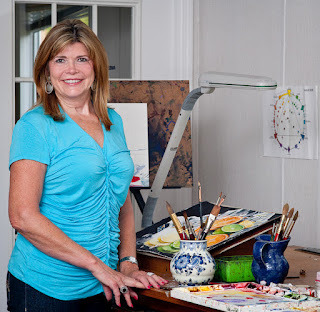 She will be posting some recipes that relate to my paintings. That should be interesting! I'm busy creating paintings for my upcoming show at Dogwood City Art Gallery. The opening reception is August 4, 7-9 PM. I will have 20 - 30 paintings hung. This is an exciting event for me! I've had several solo shows but this is the first time I have had a reception. Everyone is invited! Heres to New Beginnings! I just sent out my Summer Newsletter and in it I made a promise to Blog at least twice a month. But I'm having so much trouble getting words down. I feel like I'm a good artist but a terrible writer. Mike Nalley, a photographer friend of mine, came to my house and studio to take pictures of me for my website and a poster. Of course, this was made in my studio. I will publish some other pictures of my studio, but I have to clean it up just a little. If it's too clean, you can't get a good idea of how I work and who I am. Also, he made some pictures of me around the farm that I will publish. Yes, I am a farm girl and have been almost all my life except in my 20's. Would you believe that I chopped, hoed and picked cotton in Boaz, Alabama until I moved away at 18? Also, we had an outdoor toilet until I was 8. We really did use a Sears Roebuck Catalog!! This was when my Daddy built us a new house and we finally had hot water and gas heat. Until then, the only heat we had was a fireplace located in the middle of an old drafty house. My summers were always spent working on the farm tending thousands of chickens and turkeys. I live on a farm now but we're it's about 5 minutes to the mall, interstate and Wal Mart.we only have a few cows and I do none of the work.That's all I can get on this blog. I will post again soon.